Wireless Education explores our wireless technology in a series of Air Gap Technology articles. In our first article on Air Gap Defences, we explained the importance of providing a physical barrier against network intrusion attempts into our home network, plus the added health benefits of reduced microwave radiation exposure. In our second article, we evaluated Lightning to Ethernet adaptors to allow iPhones and iPads to connect to hardwired networks. This allows you to hardwire your iPhone and iPad so that you can access the Internet and your apps without having to have the Wi-Fi router on. In this, our third article of the series, we evaluate an adaptor that is new to market and allows Windows and Android devices (with compatible chipsets) to connect directly to an Ethernet cable, via the existing USB-B port. In a nutshell, this allows you to hardwire your Windows and Android phone or tablet. 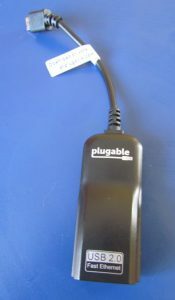 After much research, we discovered the Plugable Micro USB B RJ45 ethernet adaptor. 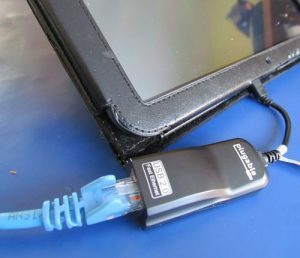 This adaptor allows the connection of a normally wireless Windows tablet (version 8.1 and 10 supported) plus many Android tablets and smartphones, to a secure network Ethernet cable. In order to have the full security and health benefits, set the device to Flight/Airplane mode, and check that Bluetooth and Wi-Fi is switched off. A major advantage is that it will provide a significantly faster and more stable connection than a normal Wi-Fi or Cellular link. Many technical specialists are aware of the biological concerns around microwave radiation exposure levels from wireless devices. This adaptor allows the usage of phones and tablets without experiencing significant levels of microwave radiation from long-term exposure. The system works for accessing the internet and texting. To make a phone call, use an app such as Skype or WhatsApp. The cable adaptor does not need external power. It runs directly from the Ethernet link between the Windows or Android device and the LAN network cable. Modern day living is all about wireless and accessibility. Devices have moved from wired to wireless to voice activated with the idea that we can tap into the Internet by just using the right voice command or key word. Whilst we love instant access, immediately available technology, little thought is given to whether this wireless technology is harmful. We may think these are good ideas, but it good for us and our children? Science and research is showing that long-term exposure to microwave radiation is linked to heart and brain cancers, infertility and increased instances of Electrosensitivity. If you think this doesn’t affect you,then think about whether you have any wireless devices in your home like: smart phones, cordless telephones, wireless baby monitors or electronic tablets. Now think about if during the day you will use more than one of those devices at any given time. That’s increased exposure. All these devices emit microwave radiation. Using any of these devices for more than 30 minutes in the day is considered long-term exposure. For key information on protecting your home environment from excessive microwave radiation exposure, we suggest you undertake our unique Schools and Families Course. This online course covers the medically recommended best practice guidance for reducing risks and using safer technology solutions. It should take approximately 40 minutes to complete and costs less than a movie ticket. Disclaimer: Always check the manufacturer’s website to ensure that the adaptor is compatible with your device, that the port is compatible (correct) and that the operating system version is correct. Wireless Education does not endorse or recommend products; however we continually seek to understand – and explain in simple language – all technology innovations that will reduce microwave radiation exposure levels.